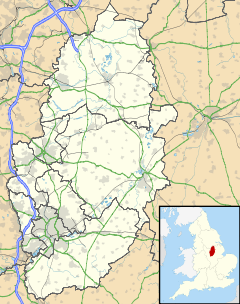 Colwick (/ˈkɒlɪk/ KOL-ik) is a village, civil parish and suburb of the city of Nottingham, in the English ceremonial county of Nottinghamshire. It is situated to the east of Nottingham's city boundary, and forms the Colwick ward within the local government district of Gedling. The village has a population of about 2,000. The village is recorded in the Domesday Book of 1086, since when the De-Colwick, Musters and Byron families have all owned the village. The etymology of the place-name is from Old English wic "specialised industrial farm" with an uncertain first element, possibly col "coal", although there have never been coal mines in the area. In 1844 there was a gruesome murder at 'Saville's Spinney', then part of Colwick Park and later part of Colwick Woods. William Saville murdered his wife and three children in the woods on Tuesday 21 May. Their bodies were found one day later by John Swinscoe of Carlton who fetched the parish constable to the spot. An open razor was found in the left hand of the dead woman. The crowd for Saville's execution numbered in the tens of thousands and twelve died in a panic in the moments after Saville was executed. Following a campaign by parish councillors, Colwick won the right to be recognised as a village again.[when?] The campaign was started because locals believed that village status would be a boost for the community. Highways officials have granted permission for the area to call itself "Colwick village", similar to Bestwood village and Gedling village. It forms part of the Nottinghamshire borough of Gedling, although Colwick Woods and Colwick Country Park fall within the unitary authority of Nottingham. Colwick lies between the River Trent and the railway line, with nearby places being Sneinton to the west, Bakersfield (to the north-west), Carlton (to the north), and Netherfield (to the east). Originally an agricultural area, Colwick was notable as the birthplace of Colwick cheese, a soft and creamy curd cheese, allegedly invented in the village in the 17th century. By the 18th century, it was already being made at a number of other locations, persisting in manufacture until the late 20th century. In the 19th century the village became heavily industrialised and was home to many notable firms such as William Lawrence & Co. Ltd, Sands and Spray & Burgess. Colwick Country Park is a 125 acres (51 hectares) designated Local Nature Reserve on the edge of the village. Colwick Hall is a large country house that is now a hotel. The Grade II-listed Manor House dates to c1675 with early 19th century additions. The derelict church adjacent to Colwick Hall was used to film the episode of The Upper Hand in which Caroline and Charlie are married. The A612 road to Newark runs through the area as the Colwick Loop Road. The railway to Netherfield and Grantham runs alongside the main road but the area has not had a station since the Racecourse station shut in 1959. Between 1870 and 1970 Colwick was the site of a huge railway marshalling yard and motive power depot. N100 Nottingham → Colwick (Colwick Loop Road) → Gedling → Burton Joyce → Lowdham → NTU Brackenhurst Campus → Southwell Line serves at night only. There is a primary school, St. John the Baptist. The parish church is dedicated to St. John the Baptist. Nottingham Racecourse and Nottingham Greyhound Stadium lie to the west of Colwick. There is a public pitch and putt course in Colwick Woods. Mary Chaworth – the first love of Lord Byron – later married Jack Musters of Colwick Hall, creating the Chaworth-Musters dynasty. Boxer Carl Froch used to live in Colwick as a child and attended the local primary school. ^ Colwick Parish Council (29 June 2017). "About Colwick Parish Council". www.colwickpc.org.uk. Retrieved 23 March 2018. ^ "Colwick Cheese". The Foods of England. ^ "Local Nature Reserve". Natural England. Archived from the original on 24 July 2011. Retrieved 1 February 2011. ^ "Colwick Manor House and Adjoining Stable, Colwick". BritishListedBuildings.co.uk. Retrieved 20 March 2014. Wikimedia Commons has media related to Colwick.